A full strength 950ml/L ethylene glycol based product for car and truck cooling systems containing a blend of corrosion inhibitors. It has been developed to meet the latest requirements of the Australian and Japanese Motor Industries. To achieve a higher boiling and a lower freezing point use clean water and a minimum 33% concentration or as your vehicle recommends of the cooling system volume. A pre-mixed radiator fluid blended with demineralised water and 50% ethylene glycol containing a mixture of corrosion inhibitors, balanced to provide maximum protection for the cooling systems of water cooled petrol and diesel engines. Being pre-mixed removes any local water contamination problems and makes coolant replacement at service times more accurate. 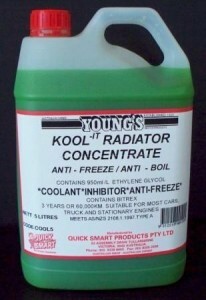 An effective quick acting radiator and cooling system cleaner designed to clear blocked radiators. 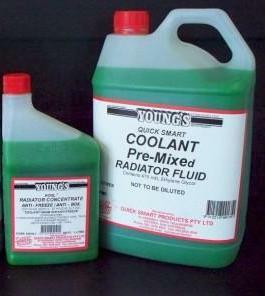 To achieve maximum efficiency of the cooling system, use before the application of Young’s Coolants or Inhibitor. 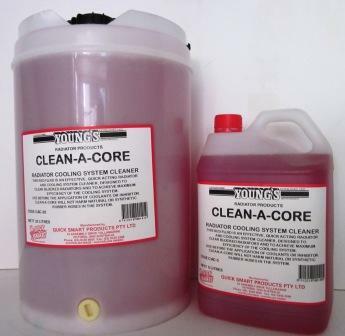 Radiator Flush Clean-A-Core will not harm natural or synthetic rubber hoses in the system. 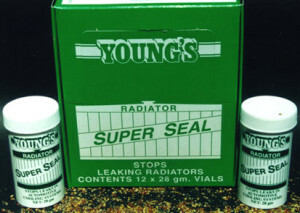 Designed to stop leaks in the radiator, cylinder head and other areas of a water based cooling system. A water soluble organic powder that will not cause harm to any components of your cooling system and is compatible with all water based automotive glycol coolants.